Coventry United versus Worcester City – it was the unimaginable fixture four years ago. 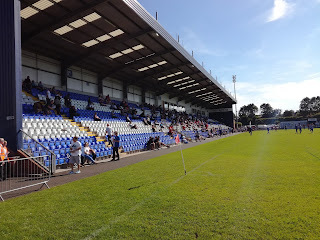 Let’s start with Worcester City, a huge name in non-league football, founder members of the Alliance Premier League which of course was the forerunner to the Conference and more recently the National League. They’ve found times hard over recent years due to the sale of their iconic St George’s Lane ground, and plans to have a new stadium built in the City seemingly continue to hit brick walls. Groundshare agreements at Kidderminster Harriers and latterly Bromsgrove Rovers have hit the club financially and at the end of last season it was something of a shock for outsiders looking in when the National League North outfit chose to drop down three divisions to Step 5. The future is somewhat uncertain, the only viable solution to see the club to return to anything like it’s former glories is via a return to Worcester, but that doesn’t look like happening any time soon. 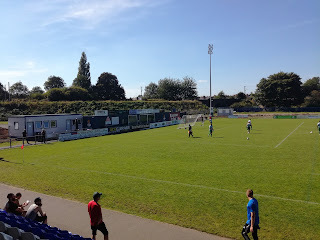 Coventry United is a very different matter, but in a roundabout way it is also connected to the loss of a ground. The Coventry City saga is well documented, and despite the fact they have plummeted from Premier League to League Two in the era since football was invented (1992), the bigger story has surrounded the clubs ownership and the Ricoh Arena stadium. To cut a long story short, due to a lease row with the stadium owners over the Ricoh Arena, coupled with the highly questionable ownership of the football club by the controversial SISU, City were forced to spend a season playing home games at Northampton Town. They did eventually return to the Ricoh but the lease ends in 2018. The future remains very uncertain. Cleary the shenanigans regarding the stadium and the ownership stirred emotions to such an extent that a group of disaffected supporters made the decision to 2013 to form Coventry United Football Club. This was not an unusual move, think AFC Wimbledon and FC United of Manchester, there were certain parallels. The club took on the colours red and green which form part of the City’s civic colours, and at that point located themselves at the Alan Higgs Centre to the East of the City Centre. 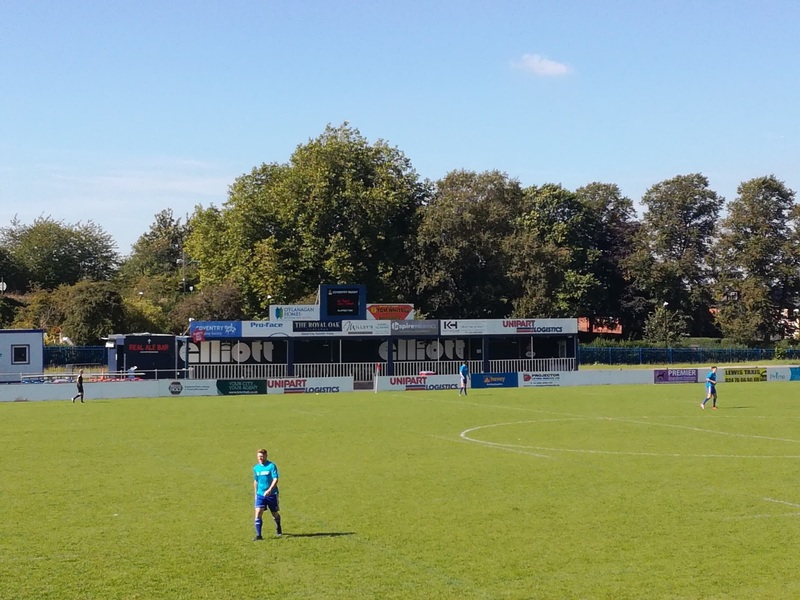 I went to one of their early games against Paget Rangers as they took up a position in the bottom division of the Midland Combination. Three successive promotions followed and they now find themselves in the top flight of the renamed Midland Football League. History was made at the start of the season when the club announced that they were to play home fixture at Butts Park Arena, the home of Coventry Rugby Club. 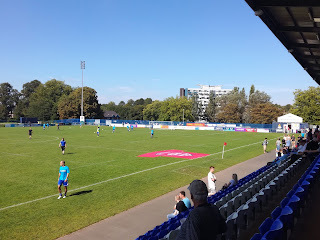 The strapline of course to this was that since the Sky Blues left Highfield Road, no club has played in confines of the City Centre, but now senior football was returning! There is also an irony, Butts Park Arena is strongly mooted to be a possible location for Coventry City once the lease on the Ricoh expire in 2018. If that is to be the case, they’ve got to get a shift on, otherwise another sorry chapter could well be about to commence. That brings me nicely onto the ground. Located very near to the City Centre, on the West side, it’s almost the identical distance Highfield Road was from the centre on the East side. You enter into a large car park, and what’s strikes you is the size of the main stand. Seating three thousand, it dominates one side of the ground, and within it are bars, function rooms, private boxes and of course some dressing rooms. The rest of the ground is open, but behind the South goal and on the West side are what appear to be more corporate facilities. They like a bit of corporate in the Rugby World! It’s a very impressive venue and in my opinion, would see them into the Conference North should progress take them to that point. So what’s the experience like as a neutral visiting for the first time? Myself and my Dad made the journey and took in a very pleasant lunch less than half a mile away, and upon arriving it’s slightly different to your typical non-league experience in that you have to buy your match ticket from a booth before presenting it at the turnstiles. No barrier divides the stand from the pitch so you effectively walk along pitch side, unless of course you choose to duck down one of the tunnels to the bar area. Mr Blue Sky - Or Should It Be Sky Blue? The bar is large and impressive, split into two parts, on primarily for food, the other for drink, but it does very much have the feel of a rugby club with lots of memorabilia and regalia decorating the walls. It was a roasting hot day, many fans were clad in the incredibly low priced club shirts and leisurewear, while children and families are clearly a big part of what United are about. Various children accompanied the players onto the pitch was a nice touch. I’ve been to matches at Rugby grounds before, notably Leigh Sports Village and Craven Park in Hull, and what was noticeable on both occasions was the somewhat officious, bordering on jobsworth attitude of the stewards, but I was pleased to see none of that today, in fact I counted a handful of stewards at the most. Not only was this a historic day whereby United were playing their first ever League game at the new home, it was also historic in that the attendance of 623 was the highest the club have had since they were formed. Worcester bought something like 50-70 with them to boost the numbers, but even so, it’s a very impressive turnout. 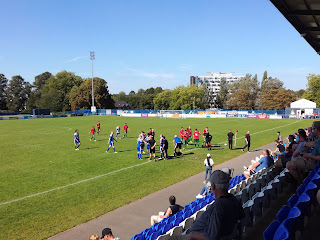 The first half was somewhat tepid, after an even start, Coventry took the initiative but couldn't find a way past the visiting goalkeeper. A couple of ‘handbags’ moments at the end of the half livened things up a little, but it was goals the game needed. Those goals came in the second period, two quick fire efforts from United totally knocked the stuffing out of a City side that seemed somewhat lacking in ideas. City had the experienced Mark Danks in attack but he cut a frustrated figure at times as his thought process was not being mirrored by his less experienced colleagues. A third United goal arrived, and that was effectively game over. Coventry maintain their 100% record, City lose their's. The gulf between the two sides was pretty wide in the end, and on this form you would have to back United to be mounting a very strong title challenge. In fact, I’ll stick my neck out and say if anyone finishes above them, then they will probably be champions. It was a tale of two City’s, one’s demise and subsequent troubles had led to the creation of something that is starting to look quite special, whereas the other is desperately looking for some light at the end of the tunnel. So, not only was this fixture unimaginable four years ago, it was the events that actually led to it taking place that would have been unthinkable for those supporters who have suffered. Remember as well, back in 2014 Worcester City made a trip to the Ricoh Arena and beat Coventry City 2-1 in the FA Cup, how times change!